Geez. Finally. We got to play a softball game without the threat of rain. What's up with the weather anyways? Oh right, we live on the Wet Coast. Well, at the very least, everything is green here. With our recent additions to the team of Chill and Bubbly, our team has become quite formidable. Including this game, we haven't lost yet. That's a good thing too since I usually blank out during the game, daydreaming about food. However, it was Ketchup who did the daydreaming this time. On a routine grounder to short, she was staring into space when Silent Bob wanted to toss her the ball at second. Thinking Arby's? No idea. Well, the team was quite hungry after the game and being such, we decided to hit up something nearby. 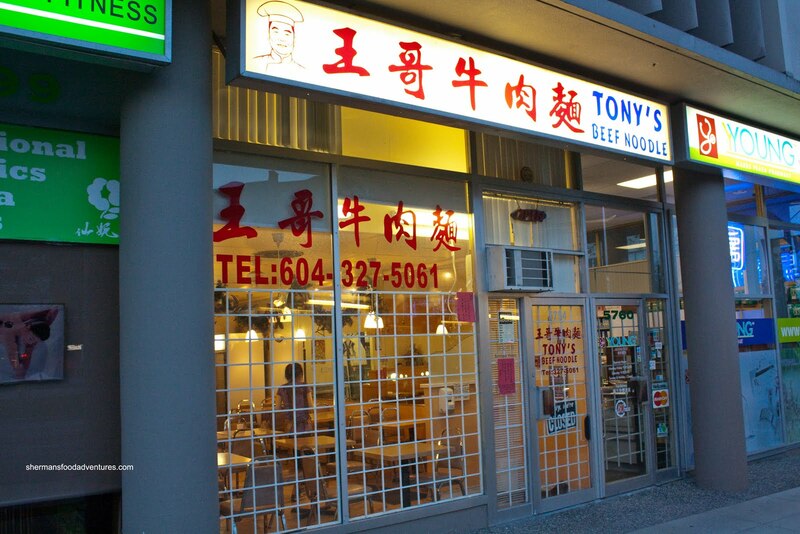 Being in the Oakridge area, we settled on Tony's Beef Noodle. Boy, this place has been here forever - at least there has been something here for awhile. As a kid growing up in Oakridge, I remember eating at this location (but am not exactly sure what it was then). They have renovated the dining room; yet have neglected to do anything with the washrooms. Typical of Chinese restaurants I guess... We arrived at around 8:20, which was 40 minutes to closing time. The one server seemed concerned with the size of our group and hesitated to seat us. Ultimately we did get to stay; but I would like to point out the service was bordering on "not-wanting-to-be-there" attitude. 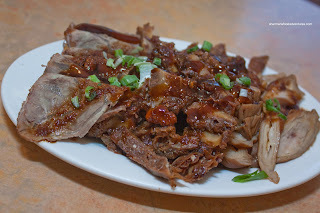 Anyways, Boss Woman and I decided to share some items starting with the Marinated Assorted Meats consisting of beef shank, beef tripe and pork intestine. Although the shank was a little dry, it was still not tough. There was just enough sauce to flavour it without being salty. We were a bit indifferent with the tripe because it was on the chewier side and dry as well. I really liked the intestine because it was soft while not falling apart. It was served warm and wasn't particularly gamy (well, to me at least). 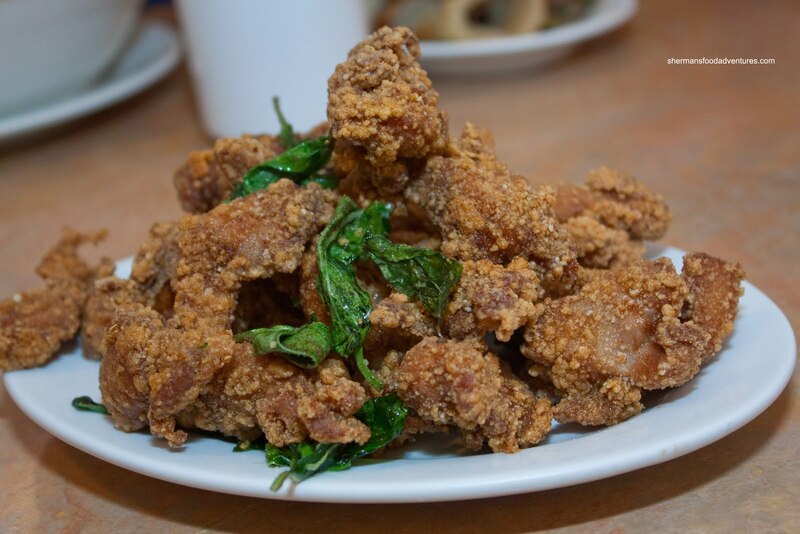 Next up was the Salty Peppery Chicken. Despite its oily appearance, this was quite good. The chicken was moist while the batter was light. It could've been crispier though. We found it to be peppery, which was a good thing. Milhouse had the Sliced Beef Shank in Green Onion Pancake. To me, it looked thick and doughy; but he thought it was fine. He remarked that the crispy exterior made the roll. 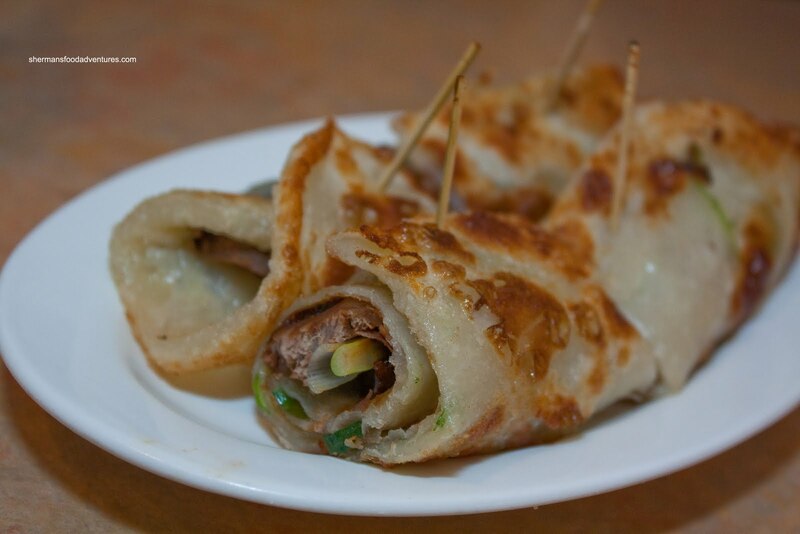 Good balance of meat, hoisin sauce and green onion. By virtue of being a TBN joint, we all had to get the Beef Noodle right? Boss Woman and I went for the Spicy Beef Noodle while almost everyone else had the regular beef noodle. Before I dug into the spicy noodle, I tried some of the regular one first. We found the broth to be decent; but after the initial hit of flavour, it became weak and ended off with a whimper. Definitely not very rich nor enough depth. 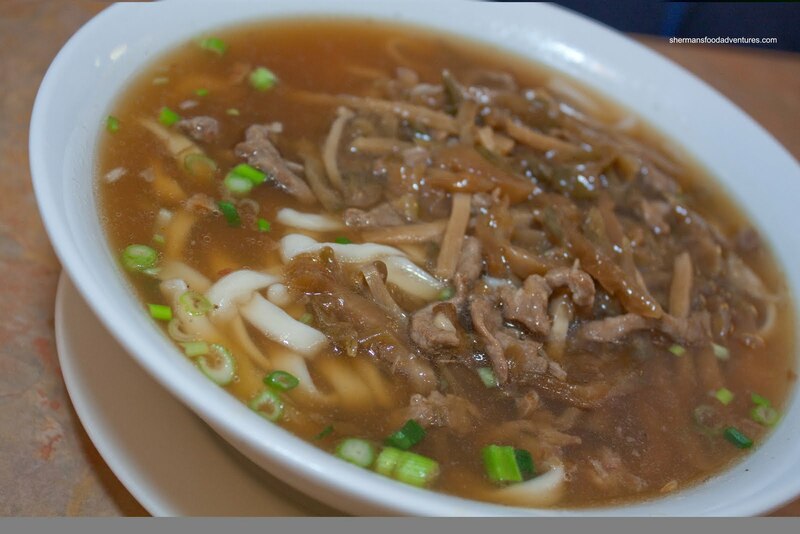 As for the noodles, they were hand-made and had a good chewy texture. The beef shank was very moist and practically melted in our mouths. It could've stood to be a little less soft since there was very little meat texture left. 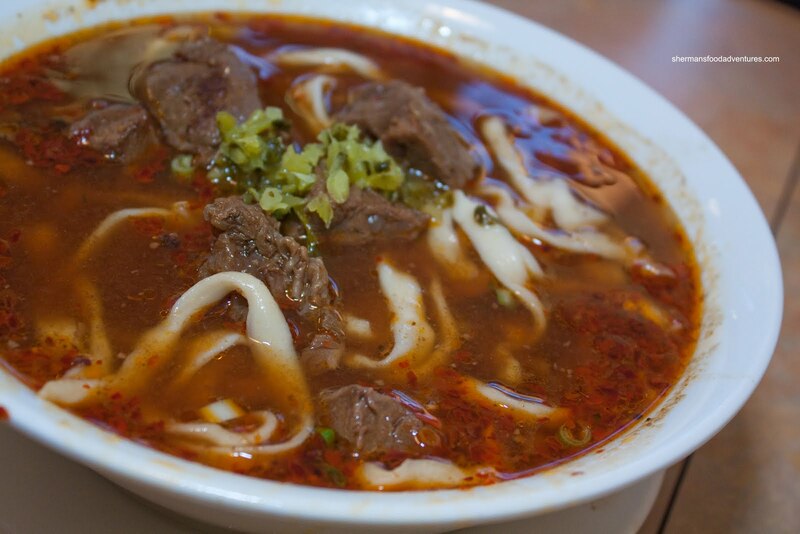 As for the spicy broth, it wasn't really all that spicy (at least to me). Furthermore, they should not skimp on the pickled greens. More was needed. Judes decided to go in a different direction with the Chinese Pickle and Pork Noodle Soup. Once again, the noodles were al dente and probably the best part. And also once again, the broth fell flat. You would think there would be tonnes of flavour from the pickled veggies and pork... nope. 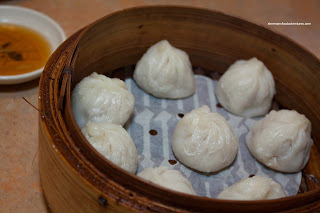 Lastly, for curiosity sake, we got an order of Xiao Long Bao as well. Actually, this was my 3rd order of XLB in one day! With that in mind, I was going to give them the benefit of the doubt since Tony's is not a Shanghainese restaurant. So it was no surprise that the dumpling skin was soft while there was no juice to speak of. However, if we looked at it as just a plain ol' steamed dumpling, they were fine. The meat had enough seasoning and it was of a nice texture - these were just not XLBs. XLBs withstanding, the food in general here is decent. There is better albeit not nearby. So, it does the job if one was in the neighbourhood. Just be forewarned that the service, or lack of, might turn some of you off. I agree, Tony's broth isn't quite there. Noodles are ok. Service ...... what service ?!? @LR Yah, service is not really their forte. That tips the scales for me since the food is only okay. Won't go back.